I'm sure everyone has seen it before... the haughty bartender. What is with that? In this economy you'd think that eating and drinking establishments would go out of their way to lure customers. On the Cape in the summer there are a lot of places I can go out to eat and drink, so the competition is fierce. I go out often so I have a lot of bartender experience, even more to the point, I supported myself when I was younger tending bar, so I know what it's like on both sides of the bar. And I do know bartenders have a lot of crummy customers, like the folks that sit all night and sip one glass of wine and leave a .50 cent tip. 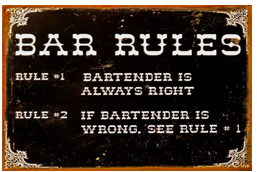 Or the messy customer, that leaves chicken wings all over the bar, spills at least one drink, and has to be escorted out after last call (did I mention he is too tipsy to tip?). Believe me, I know it's not an easy job. But from the customers side, I don't care if your last person you served was a slob, I'm not. If you have an attitude because the jerk before me didn't tip, don't take it out on me, I almost always tip 25%. Recently I've had some bad experiences at a few local upscale restaurants. Where I not only had drinks but I had dinner at all of them so I ran up a decent sized tab. Some bartenders make you feel like a jackass because you are unfamiliar with their wine list. Some totally ignores you even though it's early and there are only 3 people at the entire bar. In that case I should not have to wave you down and keep saying, "excuse me". How about the bartender that every time I order a drink says, "What are you drinking again?" I have a tab running, can't you just pick up the chit and look? I hate when they serve you your drink and there are small bar napkins right on the bar and they don't use one, what is that about? We drink, have dinner and the very second we are done with the food, they remove my drink (ok there wasn't much left in it but it wasn't quite empty), remove the plates and put down the check. Why didn't you ask us about dessert, coffee, or an after dinner drink? 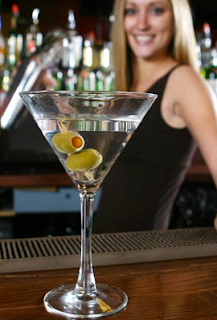 Bartending is part of the "service" industry, why are some bartenders so condescending, pompous, and self-important? Where is the service? What is my 25% tip buying me? Believe it or not, all of the above complaints happened at one place last week. I'm only going to say it was a "nice" spot in Osterville. I like the food at this place but that long time bartender.... well I have to say, the way she acted, I'm not going back there any time soon. I'm going to go some place where they actually want my business. There are a few other places on the Cape that have nasty bartenders but for the most part I get nice friendly people, that's how it should be! So thanks to the great barkeeps at The Islander, Naked Oyster, the Raw Bar, Black Cat, Trevi, Starfish, Sienna, and Wicked Pizza to name a few! Have you been to embargo on main street? Some of the best bartenders on the Cape I think. The food is exceptional too! Yes I have and I agree Embargo is a great place; bartenders, food, drink, and the crowd.